Monitor the outside of your home with the Nest Cam Outdoor Security Camera. This IP65-rated camera features a 3MP 1/3" sensor to capture 1080p video at up to 30 fps. Able to produce clear images at night thanks to eight IR LEDs, this camera connects to your home network via Wi-Fi to transmit footage. Use the free Nest app for iOS and Android devices or log in from a computer to view live video. Receive alerts when activity or sound is detected, and talk and listen to visitors right from the app with the camera's built-in speaker and microphone. The camera's wide-angle 130° diagonal field of view allows you to monitor large outdoor areas and H.264 compression helps to ensure high-quality recording and playback. The included power adapter is designed to provide constant, 24/7 monitoring without having to worry about charging or replacing batteries. The included magnetic mount ensures the camera is ideally positioned to fit your surveillance needs. Note: 30-day free trial of Nest Aware included. Service plan is required to save recorded video and is available separately through Nest. Free Nest app and a compatible smartphone or tablet with iOS 8 or later or Android 4 or later and Bluetooth 4.0. Or set it up from your computer using USB and a web browser. If you subscribe to Nest Aware, your camera streams all video to the cloud for secure offsite storage. At 720p, each camera could use 60 to 160 GB of upload bandwidth per month. At 1080p, each camera could use 140 to 380 GB of upload bandwidth per month. Box Dimensions (LxWxH) 6.65 x 6.6 x 4.95"
Cam Outdoor Security Camera is rated 4.9 out of 5 by 1349. Rated 5 out of 5 by C SUN from Nest outdoor - a great DIY home surveillance experience Impossibly easy to set up (plug in, use the Nest app to scan the QR code on the camera, and voila!? 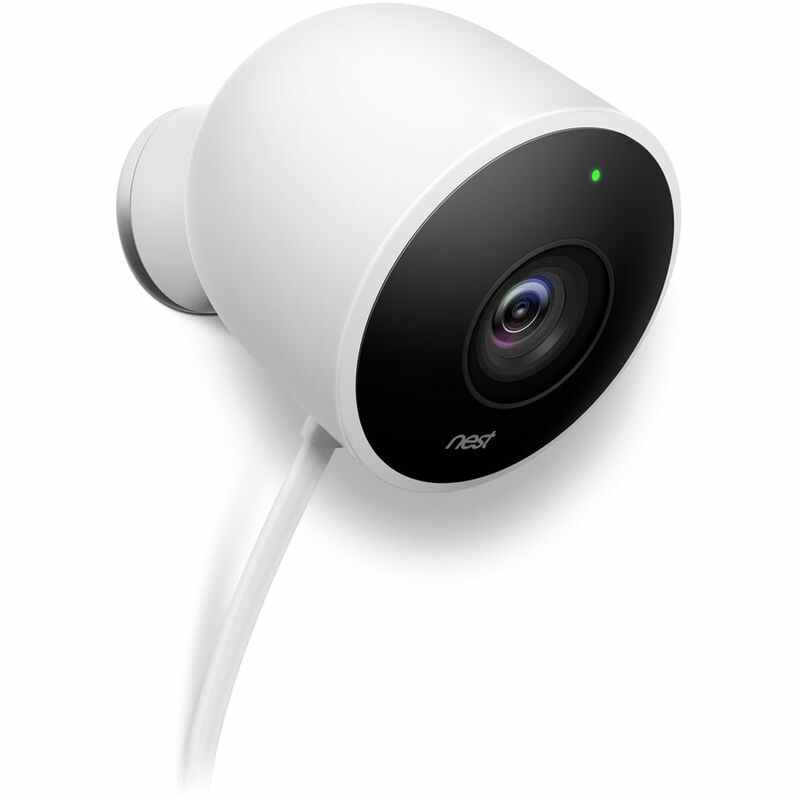 Your cam shows up in your Nest account). I have been hesitant to get the Nest camera because it is not nearly as useful as it could be unless you subscribe to Nest Aware for smarter alerts and 10 days of 24/7 video recording. BUT, the 24/7 video recording done by the Nest showed its value recently.? There was a small, unexplained fire in the garage (that thankfully stayed small and burnt itself out in 10 min) but we were able to go back through the footage to figure out who/what caused the fire.? Awesome!? It made the $100/year per camera well worth it! Rated 1 out of 5 by Anonymous from Camera looks nice that's about it. The camera itself is ok but the the cloud service provided doesn't work half the time. I'm consistently fighting with the app and website to try an view my PAID service. The camera you pay for CANNOT run consistently at 1080p because the camera over heats. I have 100mb by 10mb internet service which is more then enough to run 1 camera but the website and app are always telling me I need to the lower the resolution. If I put the camera on auto resolution it's always at the lowest setting so its useless because you can 't make out anyone's face. Even with nothing else using internet in my house the camera is constantly going offline so I only get footage half the time if I'm lucky. Let me also state that I work on networks for a living, this problem has nothing to do with my network setup and the camera is 10 feet from my router. Rated 5 out of 5 by JacobF from Attractive Outdoor Camera I already owned a Dropcam indoor camera (Nest purchased Dropcam) to monitor the interior of my house and liked how it works along with my Nest Thermostats. This exterior camera produces a HD video image that is fully viewable and controllable from a Web browser or my iPad or iPhone (Nest App) while on my home network or anywhere on a cellular network. It has a built in speaker and microphone to communicate with a person being observed. You can set up a trigger zone within the video frame to send notifications to your smartphone when action is detected. The installation is very easy but make sure you have a 120VAC outlet that is within about 25 feet of the camera. If the outlet is outdoors it will need a cover that is rated for continuous use. The magnetic base allows it to be easily adjusted in the direction you want to view. Rated 4 out of 5 by Anonymous from I finally purchased my Nest Outdoor Cam! So far So Good!! So Far So good, I did enough research on Outdoor Cameras- So for me I already have a NEST Thermostat so the connection thru the app was easy enough, depending on where you want it installed is up to you. It can be a 1 or 2 man job. But overall it works the way I want it too. I'm a fan. Pic is great, clear enough, up to 1080p, but 720p if good enough, and the night vision is cool. ( I don't expect any product like this to work at near perfect conditions or up to any kind of Military performance, so don't expect it too.) Just to watch out for perv's and wackos trying to invade your personal space. And to get some upgrades to my home. Works Great. Rated 5 out of 5 by DSmall from Love Nest Cam We did not want to pay for a Security System but wanted cameras in the front of our house and on the driveway at the side of our house to see when people drove in since the garage blocks our view. The NEST CAM is exactly what we wanted and needed for this situation. The video is clear and comes up quickly when you press the NEST app on our phones. We get alerts from the camera to our phones to let us know any activity from both cameras. We feel much more secure now. The value of the 2 cameras was a much better fit for our budget than a security system and it completely fills the need. I would, and have, recommend them to anyone. Rated 5 out of 5 by Mary Ann T from Neat to see what happens at home, while I'm away! This was a very easy camera to set up. My husband did the install on the front and side of our home which is brick. He has skills in this area, so super simple for him to install. I appreciate having the activity zones set up to alert me to something happening in these zones while I'm away. The cameras are helpful to alert me when my teenagers come home after school (because they often forget to text me that they are home :-)). Also it alerts me when service company representatives come to do work at my home, packages are delivered, or when the occasional solicitor stops by. It's really cool to see what happens when I'm away. Rated 5 out of 5 by Allison G. from Stop searching this is the one I researched many different cameras for my home. I finally decided to get the outdoor nest cam! Let me tell you first off I’m not a technology person but this camera was bought, installed, and working within 2 hours of me buying it! You won’t regret anything buying this cam! It’s a nice clear picture with a wide angle. The microphone works great, just ask my dogs who keep getting yelled at for digging holes. They are not a fan of the cam! The alerts I receive on my phone is an added bonus! You can also easily share the camera with others in your home with minimal steps. Stop searching for the perfect cam because this is it! Rated 5 out of 5 by Kevin W. from Perfect combination of quality and ease I was extremely skeptical that setting up this camera would be as easy as some reviews have stipulated. I could not have been any happier with the process- honestly the only info you need to know is your WiFi password and the software takes care of the rest. You cut the camera on, open the app, scan the code on the back of the camera, and you are on your way. Within 5 minutes you go from nothing to a fully functional security camera with remote viewing! And setting it up outside is also remarkably easy, if you have an available outdoor power outlet. Video quality and sound are excellent- I would give this 10 stars if I could! What is the Wifi range of the camera? IF you have to plug the camera into an outlet, can&rsquo;t someone just unplug it and you lose your security? How much is the monthly subscription fee for nest aware? Also i have no outdoor outlets, so was installation still easy for anyone in my situation?